MadhubalaEkIshqEkJunoon season 2, after high drama there's love brewing between Raju(Vivian Dsena) and Madhu (DrashtiDhami) who had their share of romantic moment in the rain holding an umbrella and sharing a loving eyelock as Tujh Me RabDikhtaHai played in the background. Drashti Dhami is the brand ambassador of MATRIX India's colour brand SoColor. The television star will be seen in the company's new campaign, Color with confidence. Dhami sports a look that has been created using the Caramel Twist technique, developed by the MATRIX technical and artistic teams. Inspired by the concept of a twist with two tones, the look showcases an interplay of dark and light tones. Their chemistry has charmed a huge chunk of audience and even in the not so good phases of the show,viewers stood by the show.Their chemistry sets the screen on fire and viewers don't want the show to go off air at any cost. Indeed these beautiful songs belong to popular jodi RK and Madhubala and scenes would be incomplete without this soulful music. Not to forget the show was one on Colors TV top TRP shows and still performs well.The current track has potential to get better trps if promoted well by the channel. She fought for herself while caring for her family and surely everyone loves the way junior Madhubala stand for her self against her enemies and the evil of societies. Indeed Raja is one the most cute characters who viewers can't hate except the part where CV's tried to make the audience hate him. Junior Madhubala till now didn't see her parents face and this is one of the high points of the serial,which should be revealed soon. Happy New Year which features Shahrukh Khan is releasing this year and viewers would love to see Raja and Madhu interact with Shahrukh Khan. Viewers till now have no information about the shows closure but viewers are still going strong on social media sites and expressing their disappointment with Colors TV. Before the show goes off air,viewers have to see Raja and Madhu in modern clothes and who would not won't to see Raja in a suit. This couple was one of Indian TV's best couple and even though played by the same leads it can't be created again without Drashti Dhami and Vivian Dsena. Handsome Hunk Gunjan Utreja will soon be seen hosting a new travel show Spirit of India on Zee TV. Dashing actor Gunjan Utreja who has knack of hosting shows will be seen hosting a new show on Zee TV. The show Spirit of India focuses on its cultures, traditions and also highlights on varied festivals. Having hosted a crime related show Aamna Saamna - Investigative on Colors, Gunjan's fans surely must be happy to see him on screen again. Well he is remembered as Abhay Kapoor from a popular show Madhubala - Ek Ishq Ek Junoon after his show ended the actor was busy traveling to a few places and now he is all set to be seen on-screen with a travel show. How did the show happen to you? The makers were looking for an anchor who is spontaneous and witty along with having a command over the language. Since it's a travel show there is no script. The content has to be created on the location. Not many people know that I have been an anchor for the past six years and I have been hosting a lot of live shows across the globe. So it was a perfect match I guess. I am as excited as I am for any other project of mine. I also had my own Bollywood talk show titled as See Taarein Masti Mein where I would have a candid conversation with all the actors from the Hindi film industry. So anchoring gives me an opportunity to showcase my real side which is witty and funny. Besides I have always believed that our country has so much to explore that it takes more than a lifetime to experience it. I myself have learn't so much on this show. So I am very excited as people will get to see our nation like never before. We have such a rich and diverse culture. There are so many festivals, rituals, traditions, delicacies etc. so we are not focusing on the destination but will bring out the true spirit of the largest democracy in the world with the most amazing and fascinating country India. The Season 1 of the show will focus on Festivals. You have done acting and hosting which is more difficult according to you? I have been a host for long now. And both the formats have their own challenges. In a fiction show you are dependent on a script as you are living a character. You are running against time to deliver a daily soap. In this travel show we continue to shoot for 18 to 20 hrs. since we are shooting on real locations and the moment cannot be recreated so there is very little margin of error. I remember I was in Amritsar and the director decided the sequence to be shot at a temple during the prayers and I could not take any retakes as it had to go with the flow of the prayers. So I only had one take to do that link because if I would have fumbled then we can't recreate the same prayer sequence. I am glad that I have been hosting live shows from six yrs now. All that experience has come handy. Lastly what are your future plans, will the audience get to see you doing a fiction show or something else you are looking for? I am giving six days a month to this travel show. So I am very much capable of doing a fiction show along with this. I am also hopeful that this anchoring stint will open more doors for me to host reality shows. Till now I have only been approached to participate in reality shows. We wish you all the best Gunjan for your new travel show! TV actors' social media popularity decides their film career! Drashti Dhami: 1,21,057 followers. The actress has said that she hasn't had time during the last two years as she has been busy with her show Madhubala - Ek Ishq Ek Junoon, but with the show winding up in August, she will be looking out for interesting TV and film offers. Vivian Dsena opines, "I don't think our industry functions like this. If you fit the role or can play the part, then they will consider you. I don't think it's mandatory for actors to be active on social networking sites to get films. Fans like you because you can act. Likes cannot get you an acting job, but acting can get you likes." Only 25% of people are on Twitter. Vivian Dsena: 69,987 followers. In an earlier interview, he had told us that he has been approached by Ramesh Sippy for a film, but nothing has been finalised so far. 'Jhalak Dikhhla Jaa': Dance Reality Show to Make Quick Exit due to Low TRP Ratings? Celebrity dance reality show "Jhalak Dikhhla Jaa" will reportedly make a quick exit, owing to low TRP ratings. Be it host Drashti Dhami's ouster from the show or the lacklustre performances by the contestants, this season has been near-average. Discussing host Dhami's elimination, she said: "Agreed there was lot of feedback on it. Each creative call has its consequences, having said that Jhalak is not just about one anchor, there are several factors i.e. dance, chemistry among contestants which contribute to a show's success and we are doing well." Raja to throw a surprise birthday party for Madhu in Madhubala - Ek Ishq Ek Junoon! Raja to celebrate Madhu's birthday in Madhubala - Ek Ishq Ek Junoon. Nautanki Films' popular show Madhubala - Ek Ishq Ek Junoon on Colors is garnering the attention of the audiences because of a new twist in the tale. As Raja and Madhu (Drashti Dhami) have been living in a chawl and they are facing many obstacles coming their way so now Raja will plan to celebrate Madhu's birthday in a grand way to cheer up her mood. In the last episode the viewers have seen that Raja (Vivian Dsena) and Bitto have started a garage to earn for the family but somehow it doesn't work. With this Raja is in a fix and he thinks of doing another job till his garage doesn't work smoothly. On the other side Raja and Madhu's love is blooming day by day. Madhu is taking Raja's care as his hand is injured. Now to make Madhu happy he will plan a surprise birthday party for her. Our source says, "Raja will give a surprise to Madhu on her birthday. Somehow he gets a chance to perform stunts in the film. The director will applaud his performance and he will be paid extra. He earns 10,000 instead of 5000 as he performs well. Hence this gives him a chance to plan a surprise birthday for Madhu. He celebrates Madhu's birthday by decorating the house, he also brings a cake and other gifts for her. Madhu is very happy to get the pleasant surprise." Will things turn better for Raja and Madhu in Madhubala - Ek Ishq Ek Junoon? To know more keep reading this space. Long-running show 'Madhubala — Ek Ishq Ek Junoon' will finally wrap up in August to make way for Udaan. The show was originally supposed to end on July 12, but was extended by a month. It will now wrap up on either August 18 or 25. Says a source from Madhubala, "Yes, the show will finally end. While there were rumours that it would be further extended, we don't see it happening. The show will make way for Udaan." Vivian remained unavailable for comment. The new show is based on social issues like child labour and the struggle of a family. Spandan Chaturvedi plays the central character. It also features Sai Deodhar, Lubna Salim and Kiran Karmarkar. RECAP : WHO ENTERS RAJA AND MADHUBALA’S LIFE? Madhubala Ek Ishq Ek Junoon,which airs on Colors TV, is being enjoyed a lot by the viewers due to romance between Madhubala and Raja but there is soon trouble entering into their life again. Raja takes the challenge to pay the shops rent in 2 days and starts working very hard to earn the money.Raja works a night shift driving a taxi, leaving Madhubala sleeping all alone.Some one takes advantage of the situation and enters the house.The person lifted the kerosene stove and was about to throw it on Madhubala’s face but he heard Raja’s footsteps and managed to escape. Will this person create ruckus in Madhubala and Raja’s life or will love end all evil?Keep watching Madhubala on Colors TV at 8:30pm slot every Monday-Saturday. Colors TV recently completed 6 years but is it 6 years of viewers being happy or biased treatment as accused by a huge chunk of viewers.Newsroom has received shocking feedback on our social and email accounts about the treatment given to shows. Madhubala on Colors TV hasn’t seen a promo till date even in the highest possible twist in the show,there wasn’t a promo shoot nor did the channel take any initiative. Not to forget there was Na Bole Tum and many more shows,who were given the same treatment. Will these shows get promoted soon or is this channel politics as they don’t want the shows to succeed ? Madhubala Ek Ishq Ek Junoon,which airs on Colors TV has seen a major twist with Raja having a hole in the heart. In the upcoming episodes,it will be Madhubala’s love that will heal Raja and love is unconditional. Tune into Madhubala Ek Ishq Ek Junoon on Colors TV at 8:30pm every Monday-Saturday. 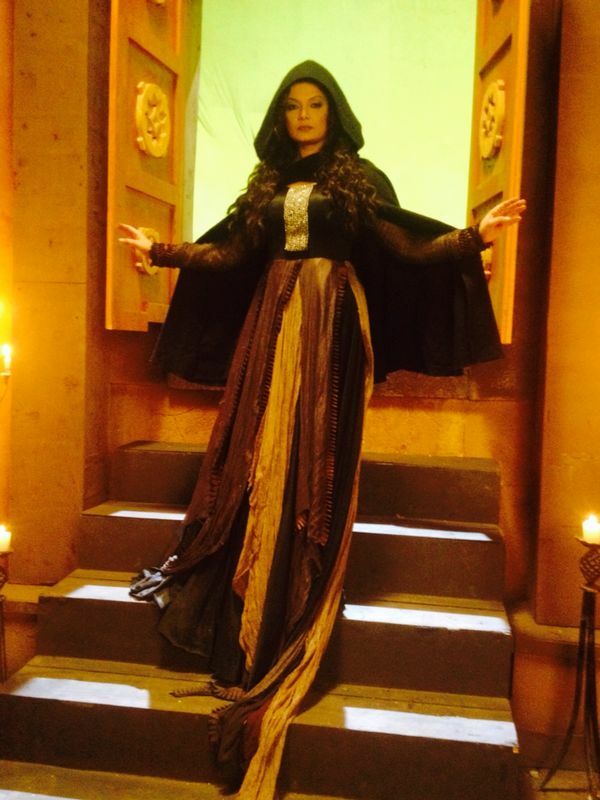 Deepshika Nagpal to be seen as a witch in Life OK's The Adventures of Hatim! Popular and talented actress Deepshikha Nagpal has been roped in to play a witch in Life OK’s popular fantasy based show The Adventures of Hatim. Versatile actress Deepshikha Nagpal who is last seen in Nautanki Films' popular show Madhubala - Ek Ishq Ek Junoon on Colors', is all set to be seen in a different avatar in Triangle Films' fantasy tale The Adventures of Hatim on Life OK.
Our source informed us, "Deepshikha has been roped in to play the character of a witch, Killkill. She will portray two shades which will be negative as well as positive. Deepshikha will be seen doing a fight sequence with Hatim." When contacted Deepshika Nagpal, she confirmed the news saying, "I am coming for an episodic in The Adventures of Hatim and my character name is Killkill. I will be coming as a witch but will pretend to be good in front of her child. While at the end she will be killed by Hatim though she is a strong witch, Hatim (Rajbeer Singh) will have a tough time in defeating her. It will air on this weekend." Talking about her shooting experience Deepshikha says, "I had a nice time shooting for the show as it was situated in Naigaon. I enjoyed playing this role where I got an opportunity to don a new attire. The costume has been designed by Neerusha Nikhat which is very creative. Then the make-up is great, I have applied a red lipstick with a curly hairdo." She further adds, "I was surprised when I heard someone saying from the sound team that I have been associated with them in the previous show Hatim too. I was just a beginner that time so I couldn't remember about it. On hearing my voice the concerned person came out and reminded me of my previous shoot. I was playing a Fairy in that episode which was a positive character while now I am playing a negative character which I actually love to play as this is not possible to play in real life. You get to explore different side of yours through negative roles (smiles)." We wish Deepshikha Nagpal all the best for her show!